Kuranda is a famous village located on the Atherton Tablelands in Far North Queensland, Australia. Surrounded by tropical rainforest and adjacent to the Wet Tropics World Heritage listed Barron Gorge National Park, Kuranda is situated just 25 kilometres from Cairns, making it a popular day trip for visitors to experience the region's natural beauty. Kuranda Village has been attracting visitors for well over a century. Initially people came to admire the mighty Barron Falls, while artisans were attracted to the region's natural beauty. Throughout the 1960s and 1970s Kuranda was popular with alternative lifestylers, a theme that still runs through the local community today. 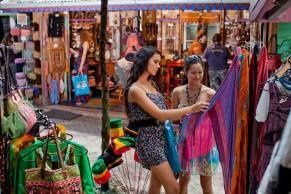 Here you will discover a variety of natural, cultural, wildlife and shopping experiences. 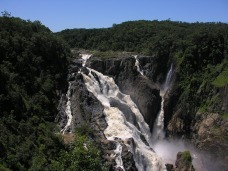 Visitors come to see the Barron Falls and to enjoy the stunning natural beauty and relaxed atmosphere of the local markets, selling unique souvenirs and gift items. 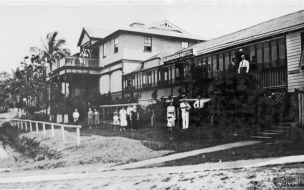 The first settlement of Kuranda was back in 1885. Surveying was first carried out by Thomas Beehan in 1888 in anticipation of the infamous and iconic Kuranda railway, that was completed in 1891. Kuranda soon became a destination for locals on holiday and honeymooners to enjoy an escape from the heat and humidity of the tropical coast. In 1935 a long awaited Barron Falls hydro-electricity station was built, supplemented by a second powerhouse in 1963. The construction of the powerhouse brought a brief influx of population, and by the late 1960s this was replaced by a new wave of settlers embracing the alternative lifestyle movement of the day. By the 1970's Kuranda became inundated with artists, musicians, craftspeople and those wishing to grow their own foods and do their own thing without government interference. 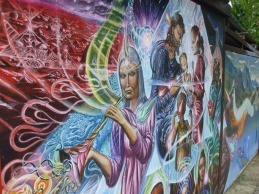 So called “hippy” communes flourished for a few years. 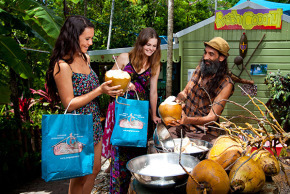 The Kuranda Original Markets began in 1978, famed for it’s hippy and chilled out vibe. People flocked to buy direct from the ‘hippy’ locals making a living out of selling their wares, the markets flourished, providing employment for local artists and makers as well as raising the profile of Kuranda Village. In 1935 a long awaited Barron Falls hydro-electricity station was built, supplemented by a second powerhouse in 1963. The construction of the powerhouse brought a brief influx of population, and by the late 1960s this was replaced by a new wave of settlers embracing the alternative lifestyle movement of the day. 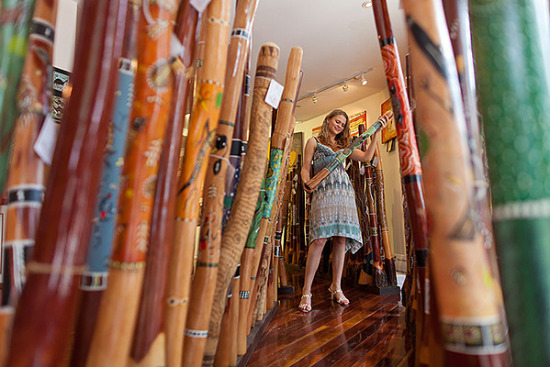 Kuranda is now lined with numerous art galleries and specialty shops offering a wide selection of locally made and designed art, clothing and handicrafts as well as a variety of sidewalk cafes and restaurants. 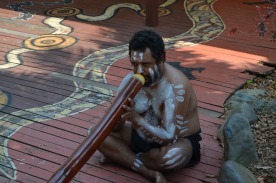 Kuranda is also a major centre for opals and didgeridoos. 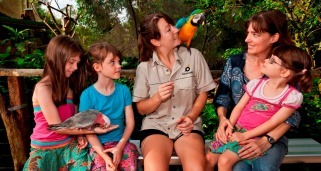 Attractions include a bird aviary, butterfly sanctuary, koala gardens and reptile park. 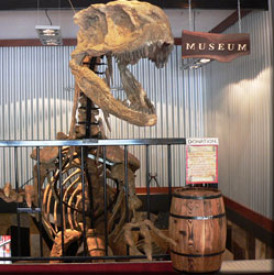 There is also a fossil and gemstone museum, candy making displays and a live honey house. 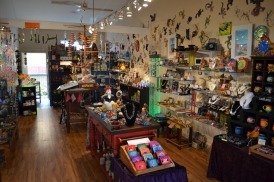 From simple stalls to fully stocked shops, there is something for everyone! You will find everything from hand-made crafts, local coffee, Aboriginal artefacts, vibrant clothing, exotic treasures, gorgeous boutiques and exclusive designs. At the Australian Bush Store you’ll find souvenirs with a difference. 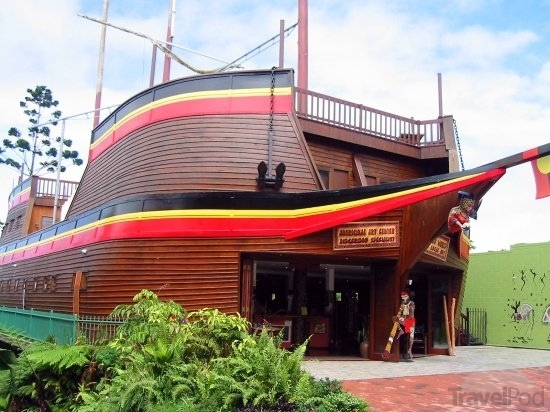 The Australian Bush Store is one of the oldest and most established businesses in the rainforest village of Kuranda.Originally a Queenslander house it was converted in 1987 without losing its quaint atmosphere and original timbers. 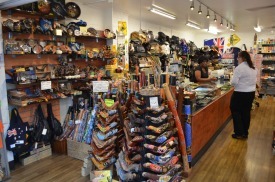 Collection of old wares and antique ornaments further enhance the old outback theme.Australian Bush Store stocks local and Australian products from tea and coffee to handmade tiles, magnets and clocks. Clothing caters for men, women and children of all sizes. Established in the tropical rainforest village of Kuranda by Sandra Viden in 1991, Sandra Viden Design has built a reputation for effortless, trans-seasonal, easy fit styles, encompassing functionality and clean lines in quality fabrics.These elegant, timeless and comfortable pieces are designed and made in Australia, from 100% Linen, Cotton/Linen, Cotton Voile and practical Cotton Blend Knits. A little eco shop with brilliant gift ideas, Naturally Gifted Kuranda is the only retail shop in Far North Queensland that stocks 100% wool felt and natural fibre supplies, along with super good wooden toys for kids and quality fairtrade clothes and other wacky bits and bobs. Located inside the Original Rainforest Markets. Kuranda is home to a number of potters, painters, photographers, glass and craft workers, masters in wood, jewellery and fabrics. 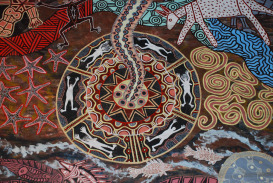 Fred Nooravi, who has a passion for Aboriginal art, and in conjunction with three local Kuranda Aboriginal artists, established Doongal Aboriginal Art in 1993. Specialising in local Aboriginal Rainforest Art as well as artwork from indigenous Central Australian artists.Doongal Galleries showcases more than 150 Central Australian artists, it also holds perhaps the world’s largest collection of locally made didgeridoos and boomerangs and a large range of other traditional artifacts are also available. Aboriginal culture did not have a written language, instead their laws, stories and social behaviour was passed on in the form of song, dance and drawings. Many of the well-known artists began their life traditionally and only as young adults had their first contact with Europeans. It is for this reason that the significance and value of their artwork is priceless. They represent the last generation to have lived the semi nomadic traditional lifestyle. Located in The Ark Gallery, 22 Coondoo Street. Peter Jarver Gallery is a magnificent photographic gallery showcasing the art of Australian award winning photographer Peter Jarver. Charging into electrical storms, dangling over thundering waterfalls, crawling around crocodile infested swamps, wading into flooded streams, clambering up rocky escarpments. It was all in a day’s work for photographer Peter Jarver, located 3 Coondoo St.
Dsicover world-class jewellery and opal outlets featuring Australian Black, Boulder and Crystal Opals and Kuranda-made pearl and gemstone jewellery. 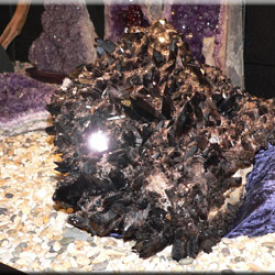 A family business for 20 years, Kuranda Opal Cave is locally owned and operated. Supplying only the very finest Australian opals. Each opal has it's own unique qualities. Hand-made in their dedicated workshop, every stage of the process is carried out from mining to cutting and setting. Australia produces around 97% of the world's opal. 90% is called 'light opal' or white and crystal opal. White makes up 60% of the opal productions but cannot be found in all of the opal fields. The black opal is said to be some of the best examples found in Australia. 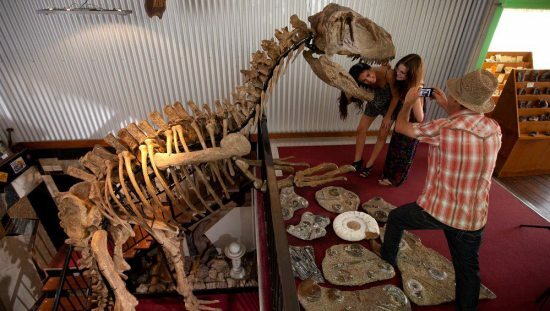 Emu Ridge Gallery is famed for its fossils & gemstone museum, as well as its star attraction - the ONLY life-size Allosaurus in all of Queensland. This perfected 9 meter replica of the Allosaurus is so well done that when it arrived in pieces in a box to Australia, Customs called in paleontologists from Brisbane Museum to check if actual dinosaur bones were being illegally imported! This fascinating collection of fossils and gemstones includes dinosaur eggs, ammonites, quartz, topaz, aquamarine and hundreds more. 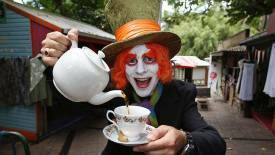 A haven for the sweet toothed, Kuranda has a myriad of amazing taste sensations around every corner. Sample some locally produced honey, sink your teeth into some fresh homemade fudge, see delicious hard and soft candies being made and Cliffy's world-famous homemade ice cream is a must! This iconic Far North Queensland tourist attraction has been delighting visitors for over 50 years. Established in 1959 to showcase and promote the many distinctive honeys from North Queensland, Kuranda’s oldest tourist attraction continues offering quality local honey and the educational activities it is known for. Watch live bees working the hive and taste over 20 varieties of local honey including Rainforest, Avocado, Eucalypt or Bloodwood. All Honey House Kuranda honey is sourced locally, direct from the apiarist. Each harvest is individually cold-extracted and bottled, so every purchase is unique. Honey House Kuranda only stocks Raw Honey – this means you can be assured that you receive your honey just as nature intended. No heat treatment, no fine filtering and no blending (except by the bees). 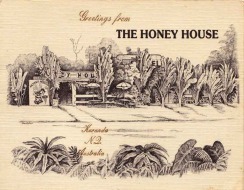 Supplying Far North Queensland Honey since 1959, Honey House Kuranda continues today to bring you the pick of our area’s famous varietal honeys. 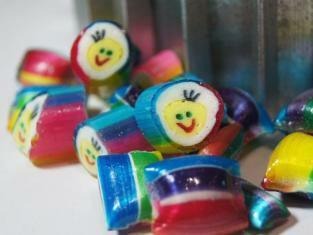 Kuranda Candy will take you through the fascinating tradition of old fashioned candy making. Watch the entire process of creating award winning rock candy.Here you can see first hand the skill and dedication required to produce the intricate designs within the candy. Kuranda Candy is located in the heart of Kuranda, be awakened by the magnificent smells and colours! A local institution, this family business has operated in this location for over 25 years! All natural home-made ice cream featuring tropical fruit and traditional flavours - no preservatives, chemicals, artificial food colouring or additives. Try flavours such as custard apple, pumpkin and nutmeg, avocado, ginger, and jaboticaba, as well as the old favourites… chocolate, strawberry, coconut, pineapple and many, many more. Now available in soya milk! 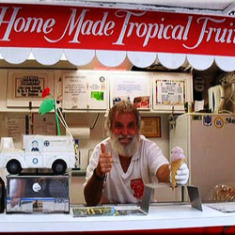 See Cliffy in the Red Ice Cream Van next to the Original Kuranda Markets Arcade. 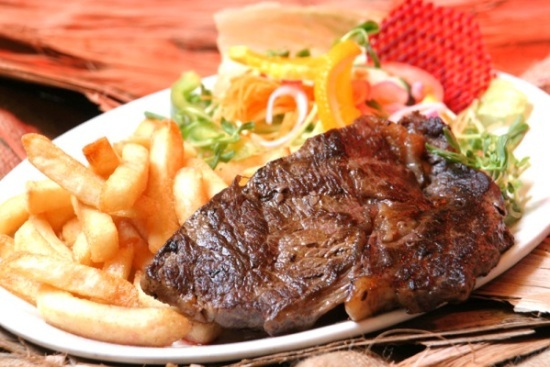 Kuranda has a number of excellent restaurants, serving both local and international cuisine. Leisurely meals in comfortable surroundings, with charming views, add to the pleasures of good food and superb Australian wines and beers. The famous German Tucker offers the wurst lunch in town. Enjoy lunch in the tropics with authentic German tastes such as Kaseknac/Brat/ Weib/ Boch Wurst. If you want fun, great German food, crazy music, zany staff and the best priced service in town then visit German Tucker! Open 7 days a week 10:00am-3:00pm. Located directly opposite the Kuranda Visitor Information Centre in Therwine Street. For the best pies in Kuranda a visit to Annabel's Pantry is a must! Sample Annabel’s famous pies, locally made and baked fresh daily. With a multiple of varieties including the ever pouplar kangaroo pie, these freshly made pies are very moorish and just right for a good lunch while in Kuranda. Make sure you get in early as they do sell out! Shop 15, Therwine St.
Kuranda Train Station features delightful heritage-listed buildings that blend with tropical charm. Take time to experience the beautifully restored station and tea rooms before venturing into the town – the scones, jam and cream come highly recommended! 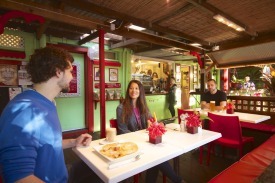 The Original Kuranda Refreshment Rooms are located on Platform 1, Kuranda Railway Station. “Dja-bu-guy” is the name of the tribe of Aboriginal people who lived in the Kuranda region. 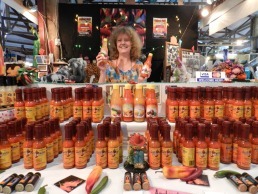 Kuranda Original Markets had their humble beginnings in 1978 organized by a group of local hippy artists and crafts people. 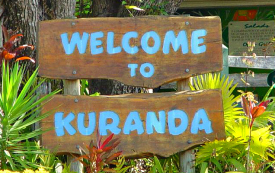 The present Kuranda village was “Ngunbay”, or place of platypus. Kuranda Original Rainforest Markets features a 9 Hole Mini Golf Course in the middle of the rainforest - REALLY! 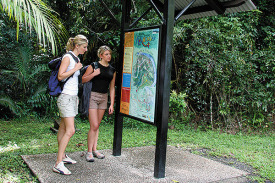 Kuranda has a network of interlinked walks that wind their way through the village and into the surrounding rainforest environment. Walks are suited to all ages and fitness levels. Here you can discover more about rainforest Aboriginal culture, understand how Kuranda's market economy came about, access Barron Gorge National Park and 'get up close' to tropical rainforest. Showcases the main street and finishes at the site of the original Kuranda markets. Explore Kuranda’s ‘market economy’ and view the adapted tropical architecture of this village in the rainforest. A walk through the rainforest. Passes through a regenerating forest. See how quickly a rainforest grows. Offers a pleasant riverside stroll down a tree shaded esplanade. Connects Barron Falls Road with Barron Falls Lookout via the Barron Falls Railway Station. Suspended high above the forest floor, the boardwalk weaves through the lush rainforest canopy before descending to the Falls Lookout. There are so many vantage points along the platform that a return walk can take longer to complete than the distance suggests. Take a scenic drive through the rainforest. From Cairns travel north along Sheridan St (Cook Highway) for 12km. Turn left at the Smithfield Roundabout (look for the Kuranda/Mareeba sign) and then follow the Kennedy Highway up the Kuranda Range. At the Kuranda traffic lights, turn left onto Rob Veivers Drive. At the next roundabout, take the 3rd exit onto Therwine St. The Kuranda Village Centre will be on the left. Trans North Bus & Coach Service operates a Kuranda Shuttle Bus that completes five return services per day.This service operates every day of the year except Christmas Day and is designed to link with the Skyrail and Kuranda Scenic Railway. John's Kuranda Bus is a cheap and cheerful bus shuttle that operates between Cairns and Kuranda several times daily. Skyrail operates a cable car service connecting Smithfield to Kuranda.Spanning 7.5km, Skyrail Rainforest Cableway traverses the McAlister Range, through the Barron Gorge National Park, taking guests on an amazing journey between its Caravonica and Kuranda Terminals. Coach transfers to the Skyrail Terminal can be arranged or optional self drive. 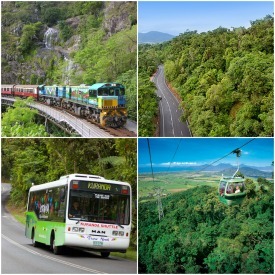 The Kuranda Scenic Rail departs daily from Cairns to Kuranda on a 1 hour and 45 minute ride. Enjoy the 34 kilometres relaxing winding journey through the rainforest-clad Kuranda Range while viewing the panorama of the World Heritage listed tropical forest and picturesque waterfalls within the Barron Gorge National Park. Kuranda Scenic Rail departs from Cairns Central Station and Freshwater Station daily. ATM machines located at: BP Service Station, Heritage Markets, Bendigo Bank, Barron Falls Hotel, Kuranda Hotel Motel, with a Money Exchange Service at the Bendigo Bank in Coondoo Street. There is a courtesy shuttle bus from the Skyrail/Railway stations to carry visitors to the markets. This runs every 15 minutes until 2.40pm. Cairns has a tropical climate. Summer months, the rainy season, (December-March) tend to be warm and humid with rain, temperatures between 30°C and 34°C. The winter months, the dry season, (June-September) are notable for their pleasant, clear days with temperatures of around 25°C. The weather in Kuranda is not as humid as the nearby coastal city of Cairns, as it is high in the hinterlands. The coolest month is July, and the hottest January. We recommend you wear light comfortable clothing. A light jacket may be required in winter. Pack a hat, water and sunscreen. June – October is the peak holiday season in Far North Queensland. It is highly recommended to book accommodation well in advance to avoid disappointment. 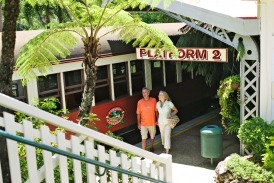 The Skyrail & Kuranda Railway Station is located 5-10mins from Kuranda Village centre. It is a short steep route so you may prefer to take the free shuttle bus that departs every 15 minutes between 10:00am and 3:00pm daily. A disabled toilet is situated in the main public convenience complex in Kuranda Village. 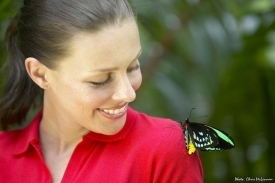 The Australian Butterfly Sanctuary is fully wheelchair accessible. In 2012, a new wheelchair friendly ramp, together with work done inside the aviary to level and widen the paths, made the sanctuary fully wheelchair (and pram) friendly. Disabled access is available throughout Birdworld. 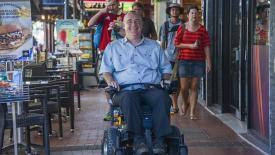 There are no stairs or any other structure that would limit wheelchair access. The Kuranda Koala Gardens are fully wheelchair accessible featuring wide pathways that can be found throughout the park.